I was planning to go back and cook baked cheese salmon lagsana because we tried it at Ikea once and loved it so much but it has been taken off the menu. Just before I knocked off, there was an ad hoc meeting at the office which lasted for an hour and a half! Reaching home, I was in such a dilemma if I should just Food Panda or somehow motivate my body, walk across the road and buy the ingredients. I did so. With a basket of ingredients, alamak, no lagsana in my neighbourhood NTUC! 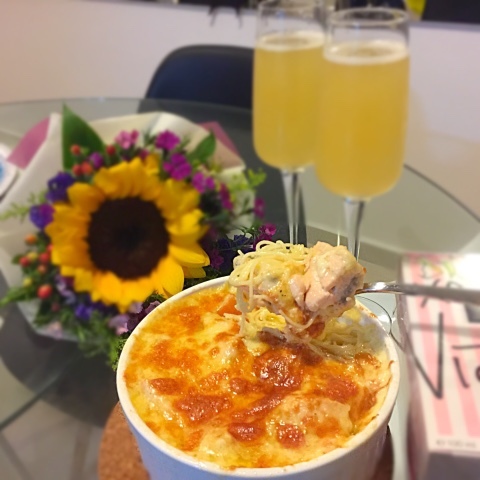 Haiz, just make do with the left over Angel Hair Pasta at home. It took about 35 minutes to prepare and bake the dish. Let's go! First I put some salted butter and pan fried salmon and tomatoes lightly. I also poured some pasteurised fresh milk and added some salt and cheese to prepare a gravy. This is to ensure that the baked pasta would not be dry. Lastly, I added in the angel hair pasta which I have boiled earlier. 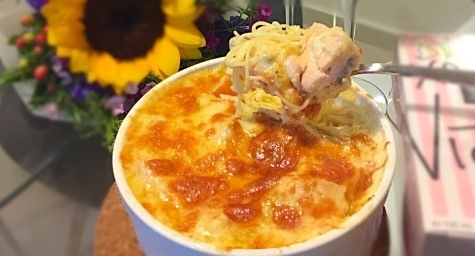 Angel Hair pasta will be cooked very quickly in boiling water. Be careful to cook the salmon half cooked as we still need to bake it. Next, just transfer everything into an oven dish. Place a layer of pasta with fish onto the dish. Put a layer of Pizza Plus or mozzarelle cheese and place another layer of pasta with fish. Level the pasta, fish and tomatoes. Place a huge amount of cheese onto the final layer of pasta, making sure every part of pasta and fish are covered. I baked mine in a convectional oven until the cheese turned golden brown in the picture. I am glad I made the choice to go ahead and cook my simple healthy dish! P.S. It is not champagne but Tiger Radler beer. I love the sweetness of the beer.